With the arrest of two persons belonging to the Raju Sansi gang, the South district police today claimed to have worked out at least 13 cases of robbery in South Delhi district, Faridabad and Noida. An old woman was killed mercilessly by some unidentified persons who barged into her house in Mussori village on Sunday. The criminals first stabbed her in the stomach and then slit her wrist and neck. The Municipal Corporation of Delhi (MCD) has been accused of misusing public funds totaling Rs 24 lakh by depositing mobile phone bills of officials of the Engineering Department that have been found to be non-operational. With its proposal to remove all hospitals and medical centers with less than 100 beds from its panel, the Delhi University is attempting to prevent the misuse of funds meant for medical reimbursement of employees. Since it began its independent cadre-building efforts in 2002 till date, the Delhi Metro Rail Corporation (DMRC) has provided employment to more than 1,000 persons following recruitment based on rigorous competitive examinations. Students in Jawaharlal Nehru University (JNU) today staged a demonstration against the hike in prices of eatables in dhabas. The students protested against the hike even as the Campus Development Committee was meeting here today. The students of Guru Gram Aeronautical School of Engineering and Technology, situated in Lakhman Vihar here, today demonstrated against the lack of basic facilities in the institute and examination fees being charged by the management. 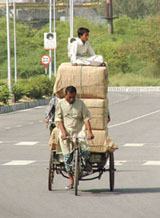 The commuters in the city were a harassed lot, as petrol pumps, barring a few company-owned stations, remained closed. For those who had not paid heed to the advance notice most fuel stations had put up, the day proved to be a nightmare. On demanding Rs 2 lakh in dowry, the bridegroom and his brother-in-law were beaten up and the marriage party was made captive in Mohalla Nazimpura Bhur under Kotwali in Bulandshahr. With the arrest of a couple, the West district police today claimed to have rescued a two-and-a-half-year-old child from Aurangabad in Bihar. The rescued girl has been identified as one Kajol, resident of Paschim Vihar. The water supplied to Delhi as well as NCR region is not of good quality. People develop serious diseases if they drink such water for long. According to a research study conducted across the NCR region which include Noida, Gurgaon, Faridabad and Ghaziabad, water supplied in the region is contaminated. The study was conducted by K.M. Johnson, scientist, Eureka Forbes, Institute of Environment. The teachers in MCD school, Mangolpuri, are an insecure lot. Ever since the death of a primary student on April 11, the teachers are living in fear. The teachers have alleged that the parents often beat them up for flimsy reasons, and that they are perpetually living in fear. 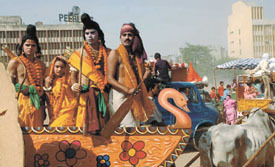 Ramnavmi, the birthday of Lord Rama, was today celebrated in the Capital with traditional religious fervour and gaiety. The festival was celebrated with enthusiasm as thousands of devotees visited various temples in the city and offered prayers. A Pakistani delegation led by Minister of State for Railways Ishaq Khan Khakwani today met with the Delhi Metro Rail Corporation (DMRC) Managing Director E. Sreedharan and also travelled on the Metro to get a first-hand experience of its latest techniques. A domestic help working in a house in Sector-17 here decamped with some cash and valuables, including jewellery worth Rs 1 lakh last night. The servant took away with him some cash and valuables, including jewellery worth Rs 1 lakh from the house. New Delhi, April 18 The North-West district today arrested three persons for beating up one Vikas (19) to death. The accused persons were identified as Harish Singh, Vijender and Naresh. Hunt is on to trace the whereabouts of another person, who is suspected to be involved in the crime. The West district police today claimed to have arrested four persons, including a security guard, who had stolen cotton fabrics worth Rs 10 lakh from a readymade garment factory in Moti Nagar on April 13. The police also claimed to have seized one country-made pistol, one knife, Rs 10,000 in cash and two motorcycles used to commit crime. The accused were identified as Rajbir, alias Raju (26), resident of Tigri and Kailash (21), resident of Sukhdev Vihar. However, the police said that efforts were being made to find out the whereabouts of Raju Sansi. The accused intercepted one Shakar Dayal Sharma on the Mool Chand flyover and snatched Rs 1. 27 lakh from him on January 1. With a spurt in robbery and chain snatching cases in the district, a special team after studying the modus operandi of different groups zeroed in on Raju Sansi gang. Accordingly on April 16, the team received a tip-off that the gang members would be present near Krishna Park, Sangam Vihar and nabbed them while they were found riding a motorcycle. During interrogation, the accused told the police that they belonged to the Raju Sansi gang and confessed to their involvement in robbery and snatching cases. They also disclosed that on April 9, they followed a woman, who withdrew Rs 59,000 from the Punjab National Bank in Chirag Delhi and snatched the amount at Panchseel Enclave while she was travelling in an auto. Similarly, the gang members snatched Rs 50,000 from another woman using the same modus operandi. Besides, the accused also said that they were involved in snatching cases in Kalkaji, Malviya Nagar, Lajpat Nagar, Defence Colony and Hauz Khas. The police said that the gang leader Raju Sansi used to target people who withdrew money from the bank. Once the target was identified, he used to inform his associates waiting outside the bank with motorcycles. The gang members either snatched the bags or used to steal them from the scooter dickeys. Hazjan Afsro, alias Basgari, 75, had been living alone in her parental home near a mosque. Her husband Haji Arif Ali of Rahul village had died after heart attack a year ago. The couple had no issue. At about 2 pm, when she was going to have a bath, some miscreants barged into her house, pierced a footlong dagger into her stomach and pulled out her intestines. Later, the assailants slit both her wrists. The woman slumped to the ground, groaning in pain. The intruders then slit her neck and fled away. At the time of the incident, all the people in the neighbourhood were engrossed in watching the Indo-Pack cricket tie. At about 3 pm, Afsro’s murder was discovered by a neighbouring woman who ran out in the street, terror-stricken. Aadil, son of Afsro’s cousin Faizal Hussain, was shocked to see the old woman lying in a pool of blood. He immediately informed the Mussori police. The police have recovered a blood-stained shirt and the daggers used in the crime. The deceased had no relatives. She had a sister who died. Thus, she was the sole inheritor of her parental property–which included the house, some land as well as her husband’s property in Nahal village. The deceased owned agricultural land on the GT Road worth Rs 50 lakhs, the police said. An Imam was waylaid and attacked with daggers by his own sons-in-law and two others under Mussori police station. His condition is stated to be serious while the accused are absconding. The Imam, Intzar Ali, 55, originally from village Basora under police station Mundali in Meerut, had been living in village Nahel in Mussori area for a number of years. He was Imam in Pirwali Masjid in Ghaziabad’s Kela Bhatta. He used to leave his village early in the morning and would return home late in the evening every day. On Saturday, he had started early from his home. As he came on Nahal-Mubarkpur Road, four persons on two scooters overtook him and beat him up. Later, they stabbed Intzar Ali repeatedly. One of the assailants had tried to slit his throat. Seeing a vehicle approaching them, the assailants fled away. Imam Intzar Ali was rushed to district hospital by his sister’s sons Babu and Irfan. Intzar told the police that he had married his two daughters with two brothers, Nizam and Kadir. His daughter married to Nazim had committed suicide by torching herself. She had been allegedly ill-treated by her in-laws. His second daughter married to Kadir had also come back to her parents’ house. According to sources, these officials were handed over the mobile phone sets four months back, but the sets were for some reason non-operational so far. They have not been allotted mobile phone numbers but their bills are being paid. The corporation deposits Rs 6 lakh every month to the Reliance group of company. The sources said that generally the Reliance group sends a list of the calls made by the subscribers. In this case, no detailed list of calls made has been provided. According to these sources, officials of the Engineering Department were given mobile phone sets of Reliance to increase their efficiency so that they could be contacted at all hours in emergencies. The Corporation had purchased the phone sets under the CUG scheme of the Reliance in which the subscribers were offered handsome concessions. Before placing the order for the mobile phones the agenda was tabled before the Standing Committee saying that the officials needed the mobile phone sets to speed up the work. But there has been no improvement in the development works of the Corporation, alleged Subhash Arya, Leader of the Opposition in MCD. The senior officials of the MCD were reluctant to comment and claimed ignorance about the issue. The officials of the Engineering Department when contacted said that they had brought the fact that the phones were not operational to the notice of their senior officers. It is, of course, another matter that most of the officials have their own private mobile phones. A high-powered committee set up by the Executive Council (EC) to review the diagnostic and medical centers has recommended that all hospitals and medical centers that have less than 100 beds will not be included in the approved panel of the University. “A lot of problems were being faced with smaller hospitals. We could not detect any malpractice as they did not have sufficient computerised medical records for furnishing any information that was sought from them,” said Prof. D. M. Banerjee, Chairman, Advisory Committee, WUS Health Center. “To check these financial irregularities, which cost the University and the college a lot of money, we have now decided that all the employees of the University can only seek treatment in those hospitals, which have more than 100 beds,” he added. The University’s approved list included all hospitals, super-speciality hospitals administered and maintained by the Delhi and Central Government, MCD, NDMC, those attached to the University Medical Colleges and private hospitals, which charge as per the CGHS rates where the employees can go for treatment and the cost of which is reimbursed by the University. Apart from the hospital, the committee with the help of sub-committees will review the diagnostic centers and verify, which ones need to be dropped from the panel. It was pointed out that fake bills from hospitals or diagnostic centers are sometimes submitted to the colleges and the university and there is no means of verifying the authenticity of the claims. “If it is a bigger hospital they maintain records of treatment, which can be easily verified by the University,” said Banerjee. He pointed out that sub committees, which will have at least one doctor will be set up to check the diagnostic centers. “These committees will visit all the pathological laboratories and ascertain the conditions there. We want to see whether they have the proper machinery, facilities and maintain the degree of cleanliness required before we include them in the approved list,” he added. The high-powered committee, which includes the Registrar, the Financial Officer, Dean, Medical Sciences Faculty, a faculty member from the University College of Medical Sciences and Prof. Banerjee that was set up last year, will also review the applications submitted by various hospitals and medical centers for being empanelled. The cadre-building exercise has been a part of the DMRC’s efforts to make itself self-reliant with an independent structure as when it started operations, most of its staff, including officers and Group C and D employees in all categories, had been drawn from the Railways. Incidentally, the DMRC comes under the direct control of the Ministry of Urban Development and not the Ministry of Railways, as most people perceive it to be. However, besides giving it a large number of employees on deputation in the initial stage, the Railways provides the DMRC technical help. But with its operations expanding continuously, it makes logical sense for the DMRC to have its own independent cadre. When Mr E. Sreedharan, a retired civil engineer of the Railways, took over as the Managing Director of the DMRC, he picked up the best personnel from the Railways for the new assignment. Later, the expansion of existing projects and launch of new ones prompted the DMRC to start its own recruitment drive. DMRC Chief Public Relations Officer Anuj Dayal told ‘The Tribune’ that at present 150 recruits, 120 in operations and 30 in technical, were being trained at the DMRC training institute in the Shastri Park depot area. The training institute, inaugurated on July 20,2002, began operations in July 2004 with a core group of instructors. “The initial contract included a training capsule as the Metro system was absolutely new to India and the DMRC had little know-how on how to train people to use the new equipment, the signalling system etc. In 2001 and 2002, we sent about 60 officials to Hong Kong, which after training became the core group of trainers at the institute. Since then, after rigorous competitive examinations, followed by the interviews, psychological and medical tests, we have recruited more than 1,000 personnel to build up our own independent cadre,” he said. With the help of advanced instructional techniques, the institute has trained staff, including train operators, station controllers, civil maintenance and electrical, signalling and telecommunications personnel. All trainings are followed by an internal validation process and feedback process. “There is a hike in prices of all eatables, tea for example has become costlier by a marginal amount, but there are other items, which have become more expensive than before,” said Muqbil Ahmar of the JNUSU. While the dhabawallas on their part claimed that the University administration has increased the rent of their dhabas and therefore they will have to hike the prices correspondingly, the students are not convinced. “There are students here who can afford the hike in prices, but there are also many who live on shoestring budgets and any amount of hike will disrupt their budget,” said a student of School of Languages. The CDC has now asked the students to submit a comprehensive report on how the issue should be resolved, since they are objecting the increase in prices. On being told by the students that the shops in the campus are selling goods at a higher price than that in the shops outside the campus, the CDC has proposed that the students file a comparative study within two weeks indicating the disparity in prices. “The CDC has assured the students of a positive response. They have asked them to submit what they think is a solution to the problem of a price hike and also highlight the difference in the price of goods being sold within and outside of the campus,” said a source. It was also pointed out that JNUSU President, Mona Das, had agreed to the hike in prices during the meeting of the CDC on February 7. “She had, however, not made it public. The students convenor, Dhananjay, has first asked for the price hike issue to be made public in the meeting held on March 17,” the source said. The students also protested against the Principal, Mr S. C. Gourd. The Executive Director of the institute, Mr Vijay Jindal, and the Director, Mr Rakesh Dahiya, said that the management would probe the allegations and take a remedial action. However, they justified charging the examination fees. The students allege that the institute charges Rs 70,000 annually for the four-year course, inclusive of the examination and maintenance fees. The confrontation between the management and the students came to a head when the demand for Rs 12,000, including the examination and maintenance fees was made. The exams will be held next month. However, there was protest from the students last year also on the issue of fees and lack of facilities. The institute was set up two years back. Recently, a student was rusticated from the institute on disciplinary ground. He was said to be in the vanguard of protests against the management. The students alleged that a good number of their colleagues were detained in the institute today so as to prevent them from taking part in the demonstration. The management refuted the charges, saying that they were attending classes. The scene took an ugly turn when a couple of persons from a local TV cable channel were detained by the security personnel of the institute. Their motorcycle was damaged and camera broken. The mediapersons staged a sit-in outside the institute in protest against the detention of two persons of the local TV cable. The principal was heard threatening a student with dire consequences for taking part in the demonstration. Mr Vikram Kapoor, DSP, Gurgaon, reached the spot and promised to register a case in connection with the allegations. The students alleged that although it is an aeronautical and engineering institute, there is no facility and infrastructure in the laboratory. Their charges include sub-standard food in the hostel and the poor academic standard. They further alleged that the institute is affiliated to Rajasthan Vidya Peeth and as per the prospectus, the institute can impart only correspondence course. But the management is charging fees as if it is providing a regular course. “I was shocked to read the news in the papers this morning. Somehow having failed to learn of the closure, I was not prepared,” said a commuter, who was seen standing in a serpentine queue at a company-owned station in Nizamuddin. A long queue had descended on the few fuel stations that were operating in the city today. “It was unprecedented, from about 7 a.m. there was a long line of people waiting to purchase petrol, it became worse between 9 a.m. and 10 a.m. when the office going crowd started pouring in,” said an attendant at the Nizamuddin fuel station. While some chose to commute in car pools, others relied on public transport. “I had fuel in my car, but I decided to use the bus, one never knows if there is any emergency at home,” said Prashant, who works with a MNC in Gurgaon. He even complained of over charging by auto drivers. “Even through they use CNG, they were over charging today. They also realise that it is the perfect time to mint money,” he added. Somehow the police were able to rescue the marriage party from the angry family of Azgar and the villagers. The marriage party had come from Delhi’s Saleempur Welcome area on Sunday. While the Azgar’s family and villagers were welcoming the guests, there was an argument between the bridegroom Shaukeen and bride’s father Azgar Ali. Soon both the parties started shouting at each other. Then the bride’s relatives started raining blows and kicks on the bridegroom and his brother-in-law. Soon several other members of the party were also assaulted by the bride’s family. Children and women in the party then started crying. Many baratis had their dresses torn while several women were seen imploring the hosts for mercy. Many of the guests were thoroughly beaten up. Some of them took to their heels, leaving even their shoes and chappals behind. After about half an hour, someone informed the police who rescued the bridegroom Shakil and others and took them to police station. Bride’s brother Sadiq said as soon as the marriage party came at 3 pm, bridegroom and his brother told his father to serve liquor to the guests and demanded Rs 2 lakh. When the guests misbehaved, they were made captive and beaten up. The bridegroom’s party said that they had never demanded Rs 2 lakh. It is not true, they claimed. The marriage party had reached late which angered the girl’s father and his companions. A complaint was received by the police from the victim’s father, Naresh Kumar, a tailor that his girl had been kidnapped on April 14 between 6 a.m. 7 pm. Naresh also told the police that he suspected the involvement of his tenant, Raju and his wife, Pooja, in the kidnapping incident. Incidentally, they had vacated the rented accommodation the same evening the child went missing. He also said that the couple had shifted their residence to Nihar Vihar. Accordingly, a case was registered in the Paschim Vihar police station and a special team was formed to trace the child. During investigation, the police received as tip-off that the suspects had left for their native place in Bihar. Later, the special team reached Obra village in Aurangabad district and rescued the child safely and returned her to their parents. The accused persons were arrested and later produced before the Tiz Hazari courts today. During interrogation, the couple told the police that they had kidnapped the child, as they did not have any child of their own. Since they were staying as tenants and the child trusted them, they had planed to kidnap the child and then claim the child as their own. The desirable level of Total Dissolved Solids (TDS) in drinking water is about 500 litre. However, out of the 378 samples collected all across the NCR region, a whooping 91 per cent were found to be over this limit which is a clear indicator of the rising concern. As far as the total hardness of water is concerned, only 29 per cent of the samples were under the desirable limit of 300 litre. When it comes to the chloride levels, up to 26 per cent of the samples were above the desirable limit of 250 litre, similar results were seen in the nitrate levels. Up to 43 per cent of the samples were above the desirable limit when it came to fluoride levels. amoebiasis; chemical impurities are even more deadly. Continuous ingestion of these dissolved solids can slowly lead to slow poisoning, resulting in life-threatening diseases in the long run. On April 11, when Abhishek Dinesh, a class III student was found dead, parents enraged by the incident attacked the teachers and accused them of negligence. It was, however, later pointed out that the boy had died because of swallowing the cap of a pen. But to the irate mob, it was the teachers and the principal, who were responsible for the death, following which they stormed to the school. The teachers recall that it was the timely intervention by the police that saved their lives. They pointed out that teachers are often abused and even manhandled by the parents if they try to discipline the students. Claiming that the parents have no respect for the teachers, it was pointed out that parents do not understand the need for disciplining their children and often misunderstand the efforts of the teachers to reform their children. To make matter worse, the teachers claim that the students themselves have no respect for them and they often misbehave. Men, women and children participated in celebrations and witnessed dance dramas with themes from the Ramayana. A large number of religious and philanthropic organisations held free kitchens at many places. Bhajans, religious discourses and recitations from the Ramchritmanas marked the birthday celebrations of Lord Rama at several places in the region. Tableaux depicting various facets of Lord Rama’s life were taken out at many places on the occasion. The Indraprastha Vishwa Hindu Parishad also organised one such procession that started from the Ramlila Maidan in Old Delhi and concluded at Gangeshwar Dham in Karol Bagh in Central Delhi. A large number of devotees also took a dip in the river Yamuna. The theft was committed when the owner of the house and his family members were away in connection with some work and the servant was alone at home. The incident came to light this morning when the family returned and found the doors of the house open, their belongings were lying here and there. A case has been booked in this regard. Meanwhile, two youths have been arrested in connection with the thefts earlier this month from two separate places, which included stealing jewellery. The North-West district today arrested three persons for beating up one Vikas (19) to death. The accused persons were identified as Harish Singh, Vijender and Naresh. Hunt is on to trace the whereabouts of another person, who is suspected to be involved in the crime. The police said that Vikas, resident of Ghazipur village used to visit the house of his neighbour, Manoj. During his frequent visits, he developed an ‘illicit relationship’ with his wife, Meenu. When Manoj came to know about their relationship, he warned Vikas to break off the relationship. However, when Manoj was away for some work yesterday morning, he was spotted coming out of the house when Meenu was alone. The accused persons arrested have been identified as Bhola (27), Virender Singh (22), Mukesh (20), and the guard Anuj Kumar (30), all residents of Prem Nagar. Acting on a complaint from the owner Maninder Bedi, resident of East Patel Nagar that cotton fabrics and polyester fabrics worth Rs 10 lakh were stolen from his factory, ‘Fashion Traders’ on Rama road, the police during investigation discovered the involvement of the security guard in the crime. The police found that Anuj Kumar was employed by the factory on the advice of ‘ADF Security Enterprises’. He was on duty when the theft took place.